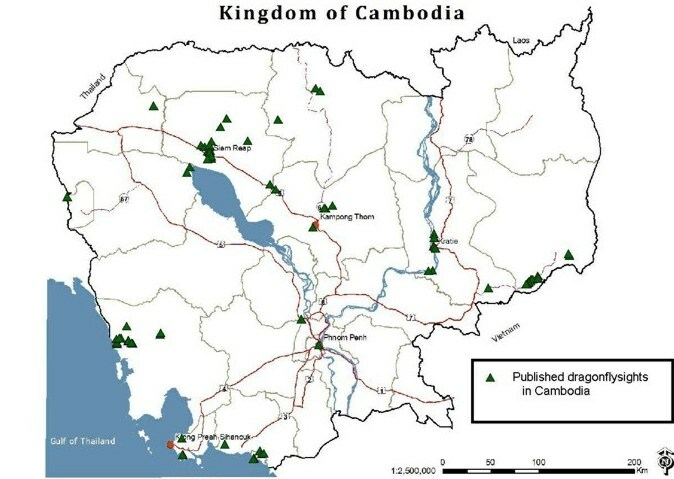 Cambodia is devided in 20 provinces and 4 cities. So far I found data from 85 locations in the references. These locations lie in less than half of the provinces as one can see on the map. For three places I was not able to find the coordinates. Most important of those is Chékô, mentioned by Asahina (1967). This location lies on the western coast of the bay of Kampong Saom. Who knows the exact coordinates? The maps at the species-pages show the locations, where the species has been found. So far the database is much to small to make conclusions for the distribution of the species in the whole country. 91-94 species are recorded for Cambodia. Comparing with Thailand with over 300 and Vietnam with over 230 species there is still a lot of room to find new species for the country. Even undiscribed species are possible, as you can read on the species pages. 11 species were only recorded in Martin (1904). Three of them, Coeliccia octogesima, Rhyothemis fuliginosa and Tramea virginia/chinensis are very doubtful. Not counted as record for Cambodia are Rhyothemis plutonia Kosterin (2010a) and Rhyothemis regia Donelly (2000), as the authors themselves were not sure enough. If not said differently, all photos are made in Cambodia. Thanks to all, who supported my website with photos. All copyrights are kept by the author! You are not allowed to take photos or maps from this website without my permission.